KEWAUNEE, WIS (Sept. 14, 2017) – Farmers in Kewaunee and southern Door counties are teaming up with multiple partners to study and demonstrate conservation practices to protect groundwater and surface water in the region. The Door-Kewaunee Demonstration Farm Network is a partnership between the Wisconsin Department of Agriculture, Trade and Consumer Protection, USDA Natural Resources Conservation Service, the Door and Kewaunee Land Conservation Departments and Peninsula Pride Farms, a farmer-led organization. The network was officially launched with a Sept. 7 field day at the Deer-Run Dairy LLC near Kewaunee, one of four farms participating in the network. The other participants include: Augustian Farms LLC in Kewaunee, Brey Cycle Farm LLC in Sturgeon Bay and Kinnard Farms in Casco. The network farms will test, demonstrate and share information about leading-edge technologies used on their farms, including cover crops, reduced tillage, low disturbance manure injection and other practices that improve soil health, increase organic matter in the soil and reduce soil erosion. Groundwater and surface water quality are top priorities for area farmers, who contend with shallow, fractured bedrock that can provide a direct path for contaminants from the surface to groundwater. Farmers will try out different methods, seeing the results in their fields, said Tom Krapf of the USDA-Natural Resources Conservation Service. 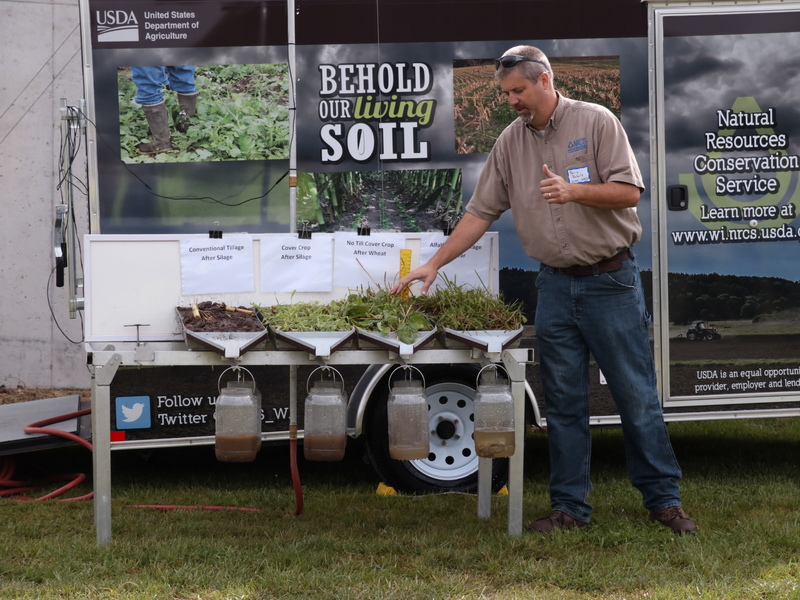 As part of the field day, farmers and other ag professionals learned how to identify the traits associated with healthy soil; observed an NRCS rainfall simulator showing how soil with different groundcovers holds water; and saw several pieces of equipment conduct low-disturbance manure applications. “It’s been exciting to see the different options in action that keeps water the way it is supposed to be – clean,” said Duane Ducat, a partner in Deer Run Dairy. 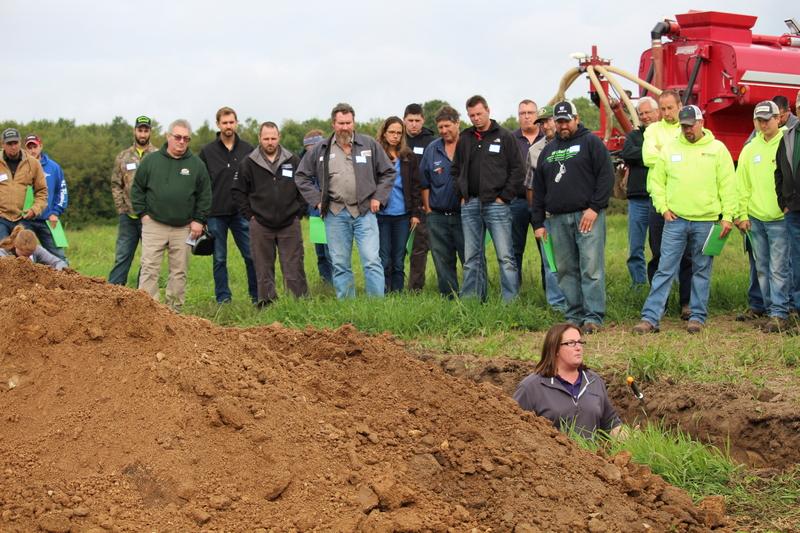 During the presentation on soil health, Jamie Patton, an educator with the University of Wisconsin-Extension in Shawano County, climbed into a soil pit and pointed out the signs of healthy soil. Patton said organic matter stores nutrients and water in the soil, which reduces runoff and improves plant productivity. Barry Bubolz, district conservationist with the USDA Natural Resources Conservation Service, demonstrated how cover crops can reduce runoff by using an NRCS rainfall simulator. He dug up four samples of soil, ranging from one that did not use cover crops at all to one that used a variety of cover crops. He then turned on the simulator, which added the equivalent of an inch of rain to the soil samples, and collected the runoff. The soil with multiple cover crops growing had the lowest amount of runoff and the highest infiltration levels, Bubolz said. Attendees also had the opportunity to view low-disturbance manure application equipment in action. Dave Eisentraut of Eisentraut Ag Services in Waldo demonstrated how a newly purchased Schuitemaker bar attached to his tractor allowed him to inject manure right into the soil. The bar creates a little trench where the manure is then applied. “There’s a great absorption rate and no pooling of manure on the surface,” said Eisentraut before demonstrating injecting a few different manure amounts into the soil. In addition to the work being done on the four demonstration farms, there are several sites in Kewaunee and southern Door counties as well as Brown, Manitowoc and Shawano counties participating in the UW Discovery Farms Tile Project that analyzes water quality in and around drain tile in fields. Data collection will begin this fall at the selected sites, said Aaron Pape of the UW Discovery Farms Tile Project. Monitoring sites will include one, centrally located site in each county that will have intensive edge-of-field monitoring and several surrounding satellite sites where periodic grab sampling will take place, Pape said. Results from grab sampling sites will then be related back to intensive sites. The Door-Kewaunee Demonstration Farm Network will host several tours and field days to showcase the work being done at each of the four demonstration farms. Event information will be posted at peninsulapridefarmsinc.org. You can also sign up to receive text alerts for “Field Days on the Fly” by texting DKDemoFarms to 88202. Text alerts are encouraged as projects are often weather dependent. Standard messaging and data rates apply. Editor’s Note: [Photos] The Door-Kewaunee Demonstration Farm Network held its first field day on Sept. 7. The event highlighted soil health, cover crops and low-disturbance manure injection. Soil health – Jamie Patton, Agriculture Agent from UW-Extension, Shawano County discussed the qualities of healthy soil. Rainfall simulator – Barry Bubolz, district conservationist with the USDA Natural Resources Conservation Service, demonstrated how cover crops hinder agricultural run-off using the NRCS rainfall simulator. 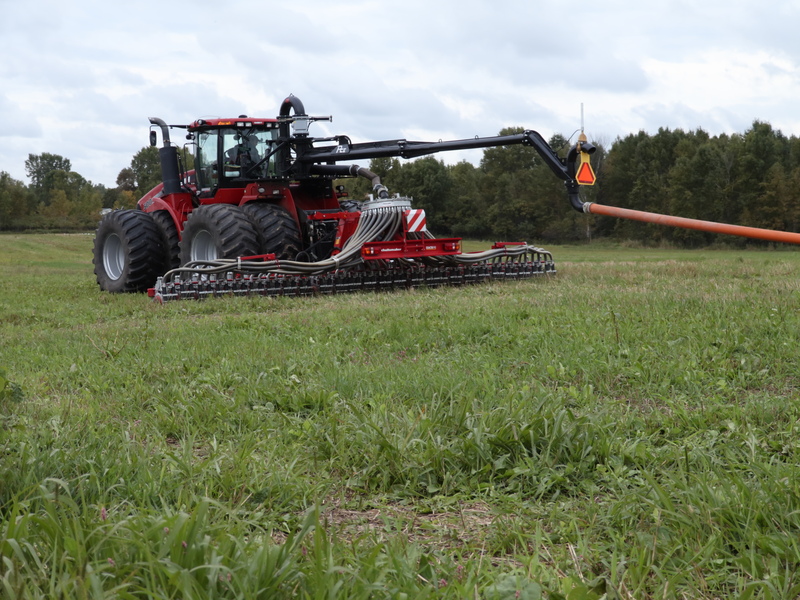 Low-disturbance manure injection – Innovations in manure technology allow farmers to inject manure directly into the soil using minimal tillage which inhibits runoff and erosion.